You know as soon as you step onto a coach anywhere in the world that it’s going to have that long distance bus smell. A smell that evokes a nauseous feeling as it wafts out from the dark interior. The feeling is amplified by the age of the vehicle, level of advertised luxury and how close your seat is to the loo. So called luxury coaches in southern Africa are no different. But compared to their “chicken bus” cousins they do get us to places in reasonable comfort while allowing us to watch the scenery along the way. We started our Africa bus adventures in Pretoria after we returned the little hire car we’d been driving around South Africa. “Time for a new travel experience and a bigger set of wheels to ride over the potholes”, we told ourselves. Plus we couldn’t take the rental car across the border into Zimbabwe, our next target country. So we booked online with a company called Intercape, receiving a ticket for a direct bus from Pretoria to Masvingo, Zimbabwe. The stated 17 hours seemed lengthy, but the bus was billed as a Sleepliner, which sounded promising. Of course the ticket didn’t mention that to catch our direct bus we needed to first take another bus to Johannesburg, then sit and wait in the bus station for a few hours. Bus stations everywhere are shady at best, but Jo’burg Park City Transit Centre didn’t live up to its truly ominous reputation. That is apart from the necessary trip to the toilets, which were of course dire. Once safely boarded on our real direct bus we settled in, bracing ourselves for a late night border crossing at chaotic Beitbridge. Here, seven hours later we exited South Africa pretty easily. The bus guys handled customs and waved us on to the immigration portacabin for an exit stamp in our passports. Then we followed some other passengers from the queue back to our bus. We followed the herd a lot that night, for lack of any signs or other information. The entry into Zimbabwe was not as bad as we expected. It took an orderly immigration hut, filling in a simple immigration form and handing over a fistful of dollars. Then we just had to wait for the officer qualified to manage the awkward process of sticking an uncooperative visa label onto a blank passport page. Next stop might have been to get a form at the customs hut next door, though there was no way to tell. By this time all the recognisable passengers had returned to stand beside the bus with their luggage open, so we returned to our herd rapidly for fear of getting lost. Following the instructions of the helpful people next to us we grabbed our rucksacks, opened them and waited. A customs guard walked right past us, and proceeded to stamp forms being offered up by these other passengers. We looked at each other wondering whether we should have had one of those forms, closed our packs and piled them back onto the coach trailer as quickly as possible. The bus drove away as soon as the trailer was loaded, passenger-less. The herd spent some time following the bus on foot as it drove around randomly devoid of passengers, dodging people, other buses, trucks and unmarked huts. This gave us a chance to chat to some friendly regular travellers about themselves, their country and the chaos of border crossings. Finally we boarded again ready to get some shut-eye. It was 4:30am and we continued to experience the meaning of the phrase “promotes Christian values” that had been highlighted on the Intercape website when we booked our ticket: Non-stop TV preachers, religious pop music and meaningful movies laden with biblical messages. A modern rendition of historical missionaries sprang to mind as I tried to sleep. Loud music delivered straight from my phone to in-ear headphones blotted most of it out. 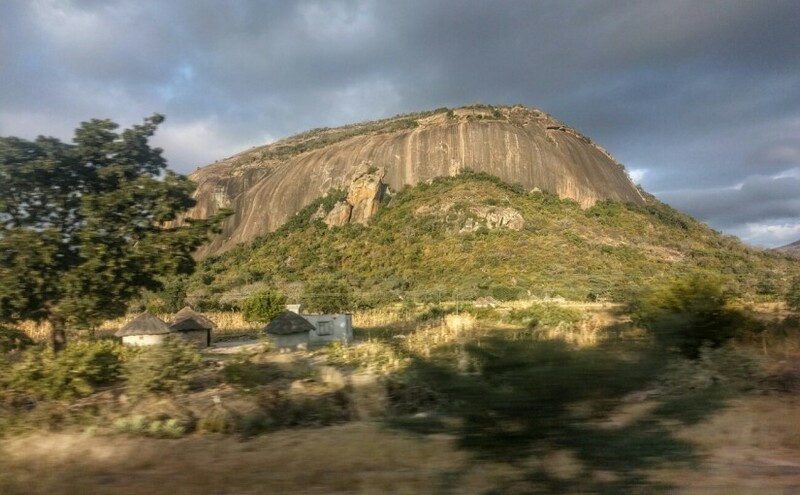 At about 8am we were dumped on the far edge of Masvingo, our destination. No fancy coach station here, just a dilapidated petrol station and ex-Wimpy burger joint. The only ‘taxi’ into town was a bloke with a very battered Mazda, which despite being overpriced did get us to our lodge in one piece and marked the end of our first African bus ride. For the next, we chose the non-luxury bus variety, but that is another story. Ever had an interesting bus ride across an international border? Tell us about it in the comments section below. Want to follow our daily travels on The Wiggly Path? We post regular updates on Instagram, Facebook and Twitter. Follow us there.